Rainforest roots, clawing vines, crystal clear creeks, pigs, dingo's, croc's & tree kangaroo's & a deserted beach all to myself....a nice little adventure. Worth a look if your heading up to FNQ. Name changed on NP's website. Last edited by ofuros on Mon 27 Aug, 2018 12:38 pm, edited 3 times in total. Looking forward to the pics. Cedar Bay is definitely on my ever expanding 'to do' list. Hi BigKev, winging my way home on a late flight as I type this, will post a couple of pics tomorrow. Home Rule lodge has shady camping spots beside the river with deep pools where you can have a dip or camp out in the paddock under the big shady trees with mountain views. Camp kitchen, Toilet block & showers. It's been a dry 'dry season' but there's still water flowing/trickling in the tributaries/feeder streams in between the main creeks of Wallaby, Slaty & Granite. Save some for climb up the ridge & down the other side to Ashwells Ck crossing. Pig diggings everywhere so filter your water. Topography. Longer going in...quicker coming out. There's that 'Wow' factor when you finally step out from the rainforest onto the beach. Didn't start coming out until midday so I camped at Granite ck camp on the return leg. Deep spot for a refreshing swim is upstream. Check for leaches after. On this occasion, no sandflies or mozzies...just a couple of sneaky leeches. Cool season in the tropics is still warm enough for a barefoot shirtless vagabond/castaway look, if you wish. I did. Met a young bedraggled European guy on the way out, walking in with barefeet with a small dilly bag swung over his right shoulder. Smiled when I said he would be the only one there....until I mentioned the pigs running through camp at night. For any other questions just give me a hoy...while the details are still fresh in my mind. Last edited by ofuros on Tue 28 Aug, 2018 6:11 am, edited 2 times in total. Rainforest roots...there's alot of looking down for foot placement & glancing ahead. Crystal clear...calming, cooling breaks before heading back into the emerald green. Out of the dark & into the light...as far as your eye can see, its all yours. As usual...a few more pics here. How did you get to the start, did you hire a 4wd? The Tree Kangaroo was amazing, I've never come across one out in the bush, that alone would make the walk worthwhile in my opinion. There is a bus service Cairns to Cooktown stopping in at The Lions Den in Rossville, then you'll have to walk to Home Rule Lodge from there...but time was of the essence for me so I used a hire car an suv, but a 2wd would be fine too as it's tarmac all the way. There's also the 4wd Daintree- Bloomfield-Rossville coastal option during the dry season which joins the inland route so you can turn it into a circuit if you wish. Cooktown is close roughly 30kms down the road from Rossville, its definitely worth a look. Bouldery Black Mountain is impressive. So was the Bennett's Tree Kangaroo encounter...my heart still beats faster when I think about it. Last edited by ofuros on Thu 30 Aug, 2018 7:05 am, edited 3 times in total. Gail @ Home Rule Lodge will provide a mud map to the start of the walk. Just be aware they'll be having a festival there at the end of September...just in case your dates clash. Nice post Ofuros. I haven't been into that area. Any more pics of the trees, looks like fairly open forest under the canopy, would be a nice hike. Can be dense & easy to lose in places, lots of tree falls & creek crossings. Camp at Granite Ck on the way in or on the return leg...great swimming hole. It's a gradual c!imb up to the main range, no views from the highest point, though you can hear the breaking waves in the distance, then it steeply descends to the beach...imagine the Daintree without roads, cars, homes, tourists, no human footprints in the sand. Originally it was a donkey track to a tin mine from memory, you'll come across remnants. There was also a hippy commune in Cedar Bay, which was raided by police back in the 70's...you can google that episode of history. Flying home on Thursday so will have look through the forest pics when I get home. Cheers for the info mate. Be good to see those pics when you get a chance. I am based in the Cape some of the time, hometown is bit south of Cairns. I might get up there and take a look based on your review. A good walk from Home Rule to the beach following the packhorse trail. If you don't have a car to get back to, you can then also walk south along the rocks, over the headland steeply to the Auravale track to go out or turn left down the track to Weary Bay and walk the beach to Bloomfield. No fresh water once you leave the Cedar Bay beach, and its hot on the rocks and the beach. ...i heard there's also the Gap Creek track, starting on the Bloomfield- Rossville rd. 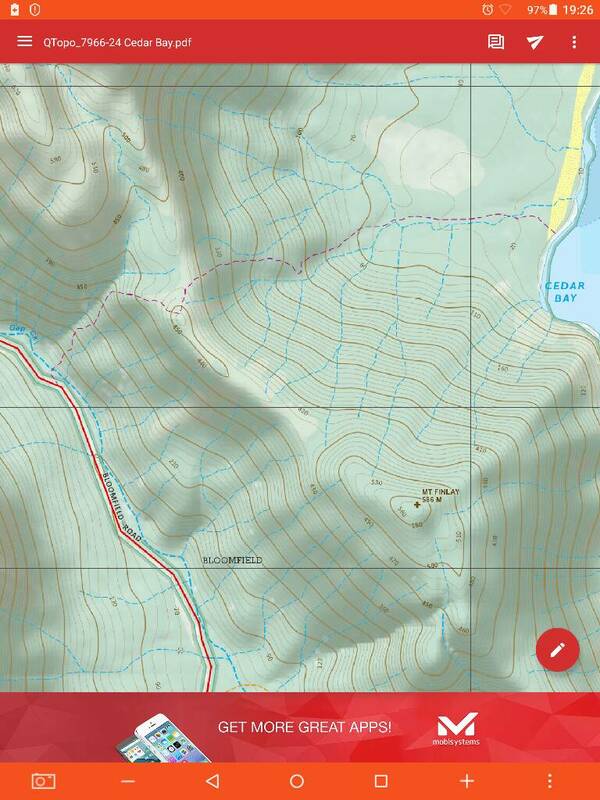 I'd try that way next time, depending on how dense it is, probably via Mt Finlay down the spur onto Cedar Bay then follow the creek behind the camp to the spur heading for the gap creek track turning it into a circuit...easy to say when in front of a keyboard. Another cool season adventure with a 4wd on the Bloomfield Rd added to the bushwalking list. Last edited by ofuros on Fri 21 Sep, 2018 6:34 pm, edited 2 times in total. Just looked through my Cedar Bay folder again...no forest pics worth showing as my camera didn't like the low light situation. Lots of blurry shots. Suffice to say the track winds its way through wet, red clay, white clay, creeks, open, dark, rooty, dense, bouldery, granity, dry, light, grassy & sandy terrains. You'll lose the track in a few places, trees fall, creeks flood, seasonal regrowth, pigs uproot & when the track does a 90° turn just as your thinking this is all to easy, just backtrack a few steps & you'll find it again. Last edited by ofuros on Fri 21 Sep, 2018 6:19 pm, edited 1 time in total. Any remnants of the old commune that used to be there ?....all I found were the stands of clump bamboo beside the water source, not that i explored too far anyway as I was mooching around at dusk. 20 or so years ago there were many fruit trees and a few bits of concrete remains of steps and slabs at the southern end in from the campsite. Park staff worked to eliminate most of these introduced species. I notice now that the climb over Rattlesnake point has been closed, so the exit over Mt Finlay on the Gap track would be the loop to do if that is even marked. It doesn't seem to be mentioned on NPks resources, which means no-one is tasked to keep it open. It'd be a stiff climb up to 450m in granite boulder rainforest if not marked. Whats the tent in the pic Digby? Thanks for the extra info digbyd...the Olympus was/is a classic, still use mine for car camping for my wife & 5yo. Thinking about it now, it must be around 35yo. Agreed, top tent for its time but too heavy now. Currently use a Mont Firefly at half the weight but It'd be marginal in snow. After 30 or so years in the tropics, I'm over snow anyway.